Grace P. Campbell, the first of three African Americans to join the Communist Party, USA, was born in Georgia in 1882 to Emma Dyson Campbell, an African American woman from Washington, D.C., and William Campbell, an immigrant from Jamaica. After briefly relocating to Texas, the Campbell family settled down in Washington, D.C. From there Grace Campbell moved to New York City around 1905. In New York, Campbell dedicated herself to community work. She donated her own salary to aid the founding of the Empire Friendly Shelter, a home for unwed mothers, where she worked as a supervisor. Campbell additionally worked for the City of New York beginning in 1915. First employed as a probation officer, Campbell then worked as a parole officer, and in 1924, became a court attendant for the Courts of Sessions. During this period Campbell gravitated towards left-wing radicalism. She was one of the founding members of the 21st Assembly branch of the Socialist Party (SP) and one of the first African American women to join the Socialist Party. Campbell ran on the Socialist ticket for the 19th District of the New York State Assembly in 1919 and 1920, receiving about 10% of the vote both years. Though unsuccessful, Campbell was the first woman of any race to run for public office in the state of New York. Campbell helped found the People’s Educational Forum, a Socialist organization that opposed Marcus Garvey’s nationalistic agenda, and in 1919, she assisted Cyril Briggs and other radicals in the founding of the African Blood Brotherhood (ABB), a secret fraternal order that advocated for armed self-defense, equal rights, and self-determination. Campbell was the only woman among the founders of the ABB as well as the only woman to serve on the organization’s Supreme Council, where she functioned as the Director of Consumer Cooperatives. Grace Campbell, like many members of the ABB, joined the Communist (Workers) Party (CP) in the early 1920s. Though she refrained from publishing and public speaking, Campbell was an influential behind-the-scenes organizer. She frequently hosted CP meetings at her house and was monitored by the Federal Bureau of Intelligence, which noted that she carried the Bolshevik red card and collected monthly dues for the local CP branch. 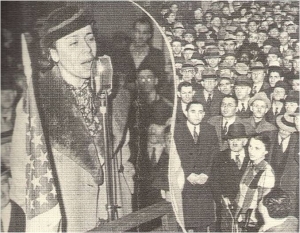 Campbell continued to work in both the revolutionary and civil service sectors until her death in 1943 in New York City. She was sixty years old. Winston James, Holding Aloft the Banner of Ethiopia: Caribbean Radicalism in Early Twentieth-Century America (New York: Verso, 1999); Mark Naison, Communists in Harlem During the Depression (Urbana: University of Illinois Press, 1983). University of Illinois Press, 1983).